Most of us now take for granted that we spend part of the year on one time, part on another. Since World War I, our nation, states, and individual localities have gone on and off observing daylight saving time; since 1967, it’s been a constant in nearly every state. But the truth is that the whole idea of switching times twice a year has a physiological cost that President Woodrow Wilson and Congress couldn’t have imagined when they first approved it in 1918. Recently, Swedish doctors looked at two decades of health data in their country to determine whether daylight saving time affected cardiovascular health. In a study published in the New England Journal of Medicine, they found while heart attacks are reduced for one day in the fall following the clocks’ return to standard time, heart attacks increased for three days in the spring following the start of daylight saving time. People under age 65 were especially affected. Other researchers have found that workplace injuries increase the Monday after the clocks spring forward because of workers’ sleep loss, but there is no compensatory benefit in the autumn when clocks fall back. Estimates of potential lives saved from driver and pedestrian fatalities with later sunsets range from 180 people per year to 366—the equivalent of saving a life every day. So there’s a clear benefit to keeping one time all year, and the question is: Which time do we pick? A look at the map suggests we’re currently in the wrong time zone entirely. 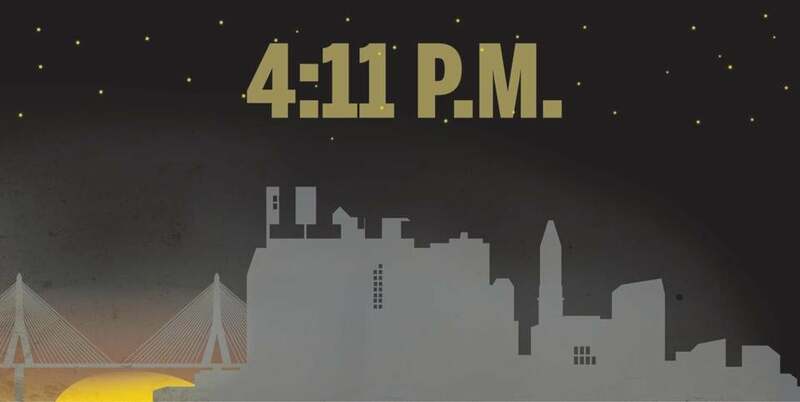 Boston lies so far east in the Eastern Time Zone that during standard time, our earliest nightfall of the year is a mere 27 minutes later than in Anchorage. When it comes to daylight, we can do much better than Alaska. Fortunately for us, there’s already a time zone one hour ahead of Eastern: the Atlantic Time Zone. Switching to Atlantic Standard Time—essentially, keeping the clock an hour forward all year—wouldn’t be nearly as radical a change as it sounds. As it is, we’re actually only on Eastern Standard Time for about four months per year, from early November until early March. In the spring, summer, and early fall we’re on Eastern Daylight Time, which is the same as AST. The strongest lobby against full-year daylight time has traditionally been farmers. If you’re an early riser, it makes sense that you wouldn’t want the sun to rise only at 8:14 a.m., which would be the reality in the depths of winter if we switched to AST. On the other hand, it makes little sense for farmers’ needs to shape policy in the highly urbanized Northeast, and for a majority of people, it might be better to have the extra hour of light in the afternoon. IDEAS: Should the school year be longer? For Boston, particularly, keeping the clock turned forward could have some unexpected benefits. More evening daylight could be part of a broader solution to retain the bright young people who come to New England from afar to our world-class colleges and universities. Retaining college graduates is so important to our region that the Federal Reserve Bank of Boston is studying the issue. But consider the actual experience of students who come to Boston for their education: On the shortest evening of the year, the sun sets here at 4:11. When they graduate, they might find themselves with options in New York, where the shortest day extends to 4:28, or Palo Alto, where it’s 4:50! Shifting one time zone would give us a 5:11 sunset—a small but meaningful competitive change. Changing to Atlantic Time in New England would be a two-step process. First, the interested states would have to decide to leave; Massachusetts, often forward-thinking, could act first. Second, the states would have to consult the US Department of Transportation, the cabinet agency that regulates time zones. States, municipalities, business interests, and others would have the opportunity to weigh in during both steps. But if they follow both science and the map, they may well decide that New England should join a time zone more suited to us, not one that works for New York. Tom Emswiler is a health advocate and former congressional health policy aide who lives in Quincy. He is on Twitter @tomems8.